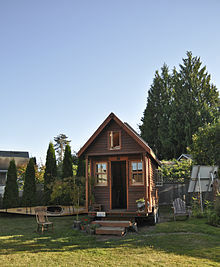 Tiny homes range typically between one hundred and four hundred square feet; the size will fluctuate depending on the owner. 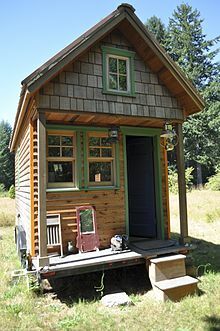 Considering the small size of tiny homes in comparison to average sized homes, the energy costs are invariably smaller; moreover, tiny homes power grids are typically sourced from solar panels which decreases the amount of energy necessary for sustainability. Thus, the difference in energy emissions between a tiny home and average sized home notably varies. While a tiny home is sustained to operate on 914 kilowatts a year, producing on average 1,144 pounds of carbon dioxide, an average size required 12,733 kilowatts which releases close to 16,000 pounds. Human beings have been the main contributor in recent environmental changes. One critical proponent of these changes relates to infrastructure; buildings affect both human beings and the environment, however the costs tend to lie within the environment while the benefits are exclusive to humans. Also, the intention of building new infrastructure is for it to be sustainable for a long period of time. As a result, the less environmentally intentional a facility, the more it will depends on consumption of natural resources. “Part of the very definition of a tiny home is that it be constructed with environmentally conscious and renewable materials.” Most tiny homes are designed to receive their services in ways that are less environmentally exhaustible. Electrical grids and public utilities are a distinguishable way tiny homes could receive various services, from water and sewage. This detail is critical for consideration when individuals move from average sized homes to tiny homes because it allows individuals both, save money while using less environmental resources. Another important environmentally conscious feature relates to toilets. Some tiny homes are equipped with incinerator toilets which get rid of waste by burning it rather than flushing. By eliminating toilet flushing, the amount of water used in a household significantly decreases. An alternative feature is a compost toilet which works by decomposing the waste which also relies on evaporation to remove the waste. Therefore, not only are tiny homes energy efficient, the makeup of these homes are also intended to be environmentally friendly. In order for new materials to be utilized in construction, they require chemicals in order to sustain the materials for long period of time; this added step takes an extra resources from the environment. An alternative to this is the usage of recycled materials which reduces the need for added chemicals because the process has already occurred; for example, the tiny homes designed by a group in Texas, consciously avoid using new materials in their construction. Bearing in mind the fact that human beings expend between 30-40% of all energy, infrastructure is best fit to include the consumption of human beings within its blueprints. Homelessness is a critical issue in the United States. According to The U.S. Department of Housing and Urban Development, about five-hundred and fifty thousand individuals were homeless on one given night in 2018. Over half of those individuals were able to sleep in different types of shelters while roughly thirty-five percent were unable to reside in a sheltered area. Despite the little information provided on such an issue in popular media, homelessness has the capacity to affect the environment dramatically. According to Environmental Council of Sacramento, homelessness is a contributor to environmental deterioration. For example, waste [litter, drug paraphernalia, etc.] produced by the homeless accumulates around their living spaces which tend to be near waterways, sewage systems, or parks which contaminates the surrounding ecosystem. This council offers steps towards conserving the environment while simultaneously dealing with the issue of homelessness. These steps include the cleaning of various water systems and public spaces in order to provide both clean water and clean areas for all individuals of the community. One of the steps also includes governmental intervention in establishing sanitary and safe spaces for the homeless in order to prevent further environmental destruction. 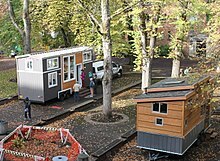 Luckily, systems for just that are beginning to form though the tiny house movement.